Members of The Muslims of America, Inc. conclude a press conference at the National Press Club in Washington, DC to draw attention to the atrocities being committed by Indian security forces against the Muslims of Kashmir. Announced also was the launch of a multi-dimensional awareness campaign and demand that the UN hold the plebiscite it resolved to in 1947 to give the Kashmiri people the right of self-determination. (Washington, DC) On May 2, 2017, The Muslims of America, Inc. (TMOA) held a press conference at the National Press Club in Washington, DC to announce the launch of a multi-dimensional campaign organized by civil rights attorneys, advocates and social justice activists to end the unceasing atrocities perpetrated against innocent men, women and children in occupied Kashmir and assure the long overdue liberation of Kashmir. In his opening remarks, Syed Sultan Ahmed Shah Gillani, Assistant Vice Chancellor of TMOA, expressed that the entire world is ignoring the plight of Kashmir. He stated the following hadith (saying) of the Holy Last Messenger (peace be upon him), “Beware of the supplication of the oppressed, even if he is a non believer, for there is no barrier between it and Allah. ” Syed Sultan Ahmed Shah Gillani warned that Allah the Almighty will answer the supplication of the oppressed and never forgets His promises. Declaring that TMOA was there “to answer the call of the oppressed”, Syed Sultan Gillani invited others to do the same. Mr. Hussein Adams, Chief Executive of TMOA remarked, “As humans, Americans, Muslims, Christians, Jews, and moral people of the Earth we have a responsibility to take action to protect the innocent.” He recounted the atrocities suffered by the Kashmiris throughout the approximately 70 years since the United Nations Security Council adopted Resolution 47, which calls for the government of India to hold a plebiscite granting the Kashmiris the right to self-determination. Pakistan’s acknowledgment of the Kashmiris’ right to freedom from Indian oppression and rule is not enough and amounts to empty lip service. 1.) Deploy UN peacekeeping troops to Kashmir to immediately stop the genocide and let the Kashmiris decide their future by holding a plebiscite. 2.) Demand international human rights organizations be permitted into Kashmir. 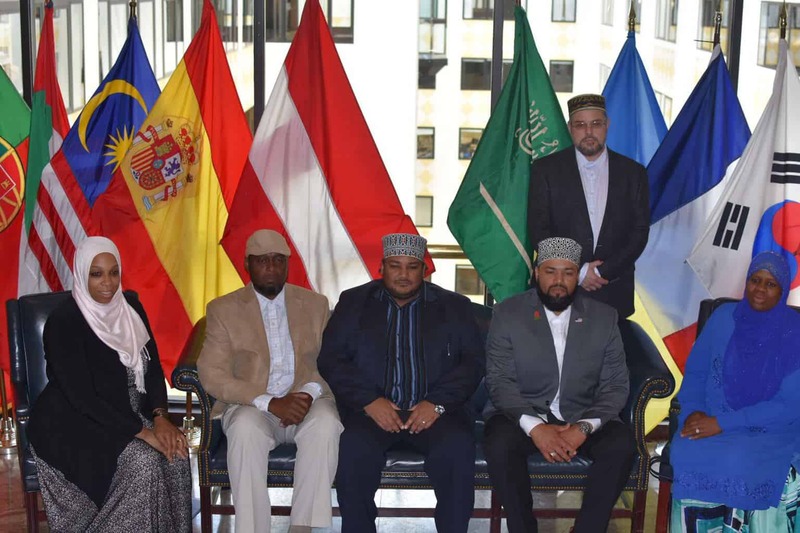 Additionally, we will approach our own government seeking support in taking an interfaith peace delegation to the region. 3.) Enforce and facilitate the 1948 UN Resolution granting a plebiscite to the citizens of Kashmir. The United Nations Security Council resolution #47 called for the drawing down of Indian troops in Kashmir and a plebiscite. 4.) Investigate and prosecute the Indian government for genocide. In addition, remove India as a member state of the United Nations. Despite 70 years of oppression, and the number of Indian occupying forces increasing to over 700,000, the Indian army has failed to obliterate or suppress the Kashmiri people. Today, a new generation of fearless youth has emerged inspired in part by Burhan Wani, whose extrajudicial murder by Indian security forces in 2016 spurred volatile protests, leading India to impose an extensive curfew in order to maintain control. Burhan Wani’s prolific and strategic use of social media and charismatic leadership energized a new generation of freedom fighters. Young schoolgirls are now championing their quest for freedom. India has clamped down and targeted the youth, employing new tactics such as shutting down the Internet and using pellet guns against the youth, blinding thousands. The press conference was held on the second day of the 3rd National Muslim Advocacy Day on Capitol Hill, where over 400 Muslim Americans traveled to the nation’s capitol, Washington, DC,to connect with their federal elected officials to promote an array of proposals designed to protect the rights of Americans and marginalized communities. Dozens of TMOA delegates participated in the event and sought to raise awareness on the humanitarian crisis in Kashmir, in addition to domestic issues. For more than two decades, TMOA has amplified the Kashmiris’ plight by holding rallies in Washington DC, outside the UN headquarters and petitioning the UN. Delegations of volunteers from the Kashmir American Friendship Society (KAFS) and American Muslim Medical Relief Team (AMMRT) have traveled to Kashmir to offer medical assistance, supplies and food. Mr. Adams pledged that TMOA would continue to condemn the atrocities and assist the afflicted, not just because the Kashmiris are Muslim, but also because any innocents who are suffering warrant aid.